Since I was able to knock out the February sweaters (yes, there were 2!) before the end of the month, I spent some time working on my Beekeepers Quilt. I also spent some time shopping for my Beekeepers Quilt. One of my favorites has been the Little Red Bicycle mini club. I had seen Little Red Bicycle yarn at Sock Summit, but I really didn’t find anything super amazing about it (which tells you how completely overwhelming the yarn and yarn fumes can be at something like that). Now that I’ve knit it with, I am completely in love with this yarn. The last package I got contained a little sample of handspun yarn (green puffs above). It really is fun to knit with handspun, you just don’t know what’s going to come out next. 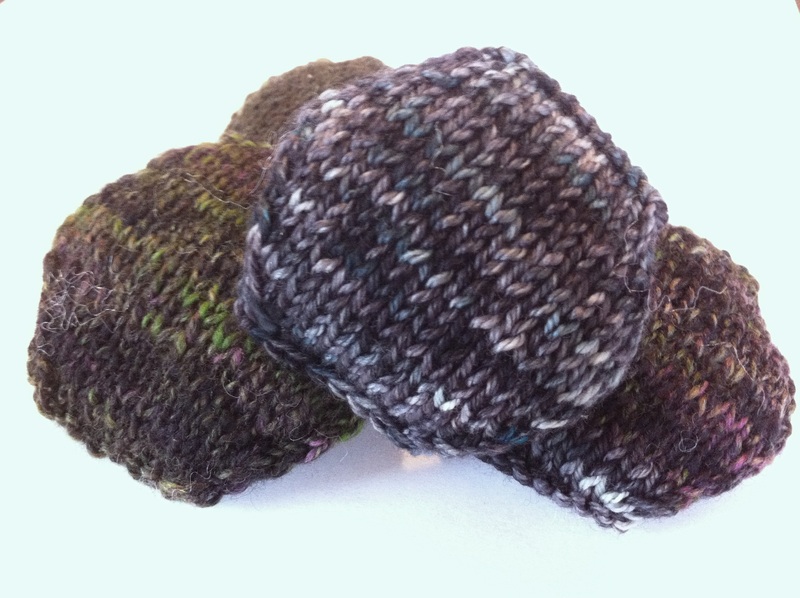 She also has a base with cashmere (blue grey puffs above) in it that is yummy to knit with. All in all, I have converted to be a LRB fan. I’ve also been stalking something called the Mini Mall on Ravelry. It’s a place where people put up mini skein swaps or destash their skeins of minis. I’ve bought a few different types of minis there, including 2 lots of Sanguine Gryphon yarn. Since this isn’t being dyed anymore I was really happy to get my fingers on more of it. As for my March sweater, I’m knitting the Goodale pattern out of some hand dyed yarn that I’ve had for several years. I originally dyed this thinking it would make a great school cardigan for Addie. However I never really found a good pattern I liked for the yardage. Plus it has more varigation than the school would probably like. I’m hoping that I’ll have enough yardage to squeek out slightly longer sleeves. The January sweater has gone to live with my mother in law as it fits her better than I. It ended up being a better fit for a tall person. When am I going to realize that I am NOT 5’9″ tall? She did comment that it was a bit low cut for her, but since she’s going to wear another shirt under it anyway, I don’t think it really matters. I’m hoping to get a photo of her in it for the blog.